Modular Style Stairway Attractive Modular Style Stairway allows for economical cost and quick installation. Steps are 36" wide. The bolt in place non-skid perforated treads are powder coated blue. Top and bottom anchor brackets are included. Railing are bolted in place. 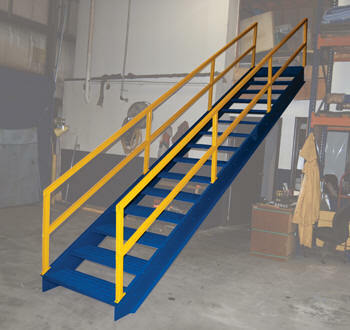 The square handrail tubing has a powder coat yellow finish. Meets OSHA requirements. Ships knock-down. Please See Chart Below And Select Correct Option.